University of Alabama football coach Nick Saban will be the keynote speaker for the 12th annual American Values Luncheon on Thursday, March 21. 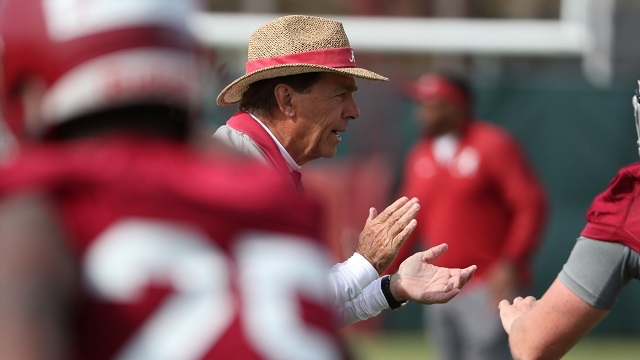 Saban, known for his relentless pursuit of excellence in addition to coaching national championship-winning football, will field questions from Scouts and guests during a town hall session. Past speakers at the luncheon include Shaquille O’Neal, Bo Jackson, Gene Stallings and Gus Malzahn. The American Values Luncheon is a fundraiser benefiting the youths and programs of the Greater Alabama Council, Boy Scouts of America. The Greater Alabama Council, based in Birmingham, serves over 28,000 youths in 22 counties of central and north Alabama. The event begins at noon in the North Exhibition Hall of the Birmingham-Jefferson Convention Complex. For more information on the luncheon, or to secure a seat for the event, please contact Kim Thomas at 205-969-4251 or [email protected].